There were “approximately a dozen” cases in the past 10 years that “involved improper behavior on the part of individual employees,” Phalen said. . . . The compilation of willful violations, while limited, contradicts repeated assertions that no deliberate abuses occurred. “There’s a pattern of the administration making misleading statements about its surveillance activities,” Jameel Jaffer, a deputy legal director at the American Civil Liberties Union, said in a phone interview. “The government tells us one thing, and another thing is true.” . . . The disclosure undermines the Obama administration's assurances to Congress and the public that the NSA surveillance programs can't be abused because its spying systems are so aggressively monitored and audited for oversight purposes: If Snowden could defeat the NSA's own tripwires and internal burglar alarms, how many other employees or contractors could do the same? . . .
. . . All voters oppose 54 - 40 percent the stricter new gun control laws which led to the recall effort. Democrats support the stricter laws 78 - 16 percent, while opposition is 89 - 7 percent among Republicans and 56 - 39 percent among independent voters. Women are divided on the stricter laws 48 - 45 percent, with men opposed 64 - 33 percent. "With wide partisan and gender divisions, Colorado voters oppose the state's stricter new gun control laws, but they don't want to recall State Senate President John Morse or Sen. Angela Giron because they supported these laws," said Tim Malloy, assistant director of the Quinnipiac University Polling Institute. "Philosophically, voters don't want a recall election every time they disagree with a legislator. They'd rather deal with it every four years." . . . There is some disconnect between the individual parts of the gun laws and the overall feelings that people have to the new laws. Could it be that while they support background checks in principle, the fees for transfers aren't popular? Colorado voters support 82 - 16 percent requiring background checks for all gun buyers. Support is strong among all groups. Voters are divided 49 - 48 percent on a ban on the sale of high-capacity ammunition magazines that hold more than 15 rounds. Colorado's new gun laws will make the state less safe, 40 percent of voters say, while 37 percent say the state will be safer and 16 percent say the laws won't make a difference. Background checks and a limit on magazines could not have prevented the Columbine or Aurora mass killings, voters say 68 - 25 percent, and could not have reduced the number of people killed in those shootings, voters say 56 - 40 percent. . . . Newest piece in the Philadelphia Inquirer: "Speeches won't boost economy"
President Obama arrives in Pennsylvania today to push up his sagging approval ratings. But he faces a tough sell. According to the latest Gallup poll, his job approval rating on the economy stands at just 35 percent. We are more than four years into the "recovery," and one thing is clear: This continues to be by far the worst recovery on record. And that goes for general growth in gross domestic product as well as for job growth. While the unemployment rate has fallen from its peak of 10 percent down to 7.4 percent, that doesn't mean many new jobs. People are classified as unemployed only as long as they are actively looking for work. The unemployment rate can thus fall either because people have found jobs or because they have given up looking for work. In this case, about 70 percent of the drop has been because people have given up looking. Job growth has been abysmal. Jobs have increased by 2.9 percent in the more than four years since the recovery started, but that is less than a third the job growth seen in the average recovery since 1970, and less than a fourth the growth seen after other severe recessions. The number of new jobs hasn't come close to keeping up with the growth in the working-age population, and the percentage of the population working has quickly fallen to a level we haven't seen since the 1970s. A stunning 97 percent of the net jobs added this year have been part-time jobs. . . .
Three young men are on trial due to the shooting death of Danzele Johnson. In Elkhart Circuit Court today, jurors heard from the man who pulled the trigger. Rodney Scott recounted what happened Oct. 3, 2012, at 1919 Frances Ave., Elkhart. He fired several shots after intruders broke into his home. Johnson, a 21-year-old Goshen resident, was killed. Blake Layman, 17, Elkhart, was shot in the leg. Prosecutors say Anthony Perez Sharp Jr., 19, Goshen, Jose Quiroz, 17, and Layman also entered the home while Levi Sparks, 18, Elkhart, served as a lookout outside. The three have been charged with felony murder. Under Indiana law, if someone dies during the commission of a felony, those who were engaged in the underlying felony can be carged in the person’s death. . . .
“As soon as I sat up on the side of the bed, there was this ‘boom!’ and my whole house just shook,” he said. A second or two later Scott heard the noise again — and then heard it a third time. “And I said, ‘My goodness,’” Scott recalled. Scott told the jury his next-door neighbor’s home had been broken into a week or two prior. He’d picked up his cell phone when he heard the noises in his home. Scott loaded his .9mm handgun — which he testified he’d never fired before — and went downstairs. Scott walked quietly at first, then ran down the last set of steps to make a lot of noise. Downstairs, he saw someone run from the kitchen. He also saw two people — later determined to be Johnson and Quiroz — in the doorway of the bedroom. “You see all these people in your house, you don’t know what’s going to happen to you,” he said. . . .
Was the shooting of the Australian in Oklahoma a hate crime? Was it a revenge killing for Trayvon Martin?
. . . James, who is black, was arrested along with his friends and suspected accomplices, Michael Dewayne Jones, 17, and Chancey Allen Luna, 16. James and Chancey were charged with first-degree murder. Michaelwas arrested for using a vehicle to facilitate the discharge of a weapon— the suspects allegedly fired on Lane from their car as he jogged down the street — and on charges of being an accessory after the fact of first-degree murder. Some of James‘ tweets are proving enlightening. Another: He brags he “knocked out 5 woods since Zimmerman court.” The word “woods,” The Blaze said, is a term to describe white people in a derogatory manner. And his Facebook account — before it was deactivated — wasn’t much tamer, The Blaze reported. One posting from April 19 read: “At the end of the day it’s all about the kill.” . . . There are very few African American men in this country who haven't had the experience of being followed when they were shopping in a department store. That includes me. There are very few African American men who haven't had the experience of walking across the street and hearing the locks click on the doors of cars. That happens to me -- at least before I was a senator. There are very few African Americans who haven't had the experience of getting on an elevator and a woman clutching her purse nervously and holding her breath until she had a chance to get off. That happens often. . . . In reading this quote from Obama, it sure seems as if he is indicating that Trayvon was being followed because of his race. If so, Obama sure seems to imply that the shooting was racially motivated. To put it slightly differently, when Obama refers to Trayvon as some who could have been his son or that he could have been Obama, isn't Obama saying that could have been the case because Obama is black? Here is something that John Kass wrote in the Chicago Tribune. Obama pronounced the killing as racially motivated, though he didn't use the words. He didn't have to, such is his prowess. It was so smooth that few noticed. He put the killing in a racial context, and that was enough. "You know, when Trayvon Martin was first shot, I said that this could have been my son. Another way of saying that is Trayvon Martin could have been me, 35 years ago," Obama told reporters at the White House on Friday, addressing last weekend's acquittal of Martin's shooter, George Zimmerman. Could Obama have been Trayvon Martin 35 years ago? Perhaps. If so, then any of us could have been Trayvon Martin. And I could have been Trayvon Martin. Racial motives weren't established at trial. And reportedly, the FBI still hasn't found racial motives in George Zimmerman, who is Hispanic. 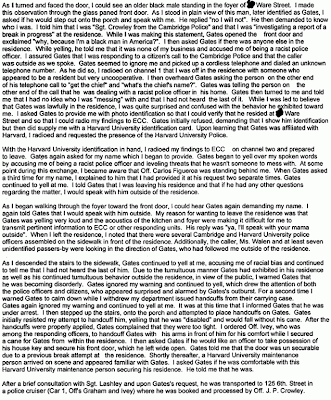 . . .
. . . My understanding is at that point Professor Gates is already in his house. 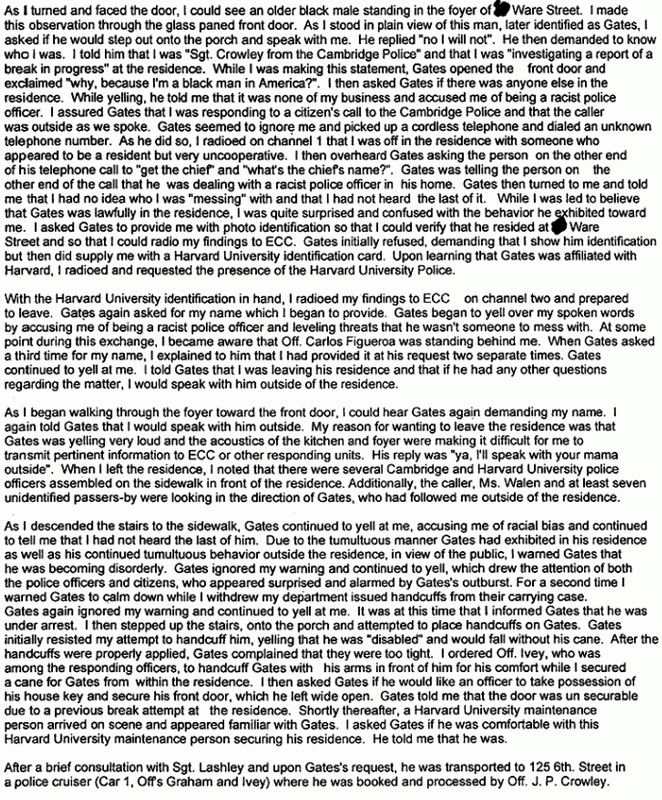 The police officer comes in, I'm sure there's some exchange of words, but my understanding is, is that Professor Gates then shows his ID to show that this is his house. And at that point, he gets arrested for disorderly conduct -- charges which are later dropped. Now, I don't know, not having been there and not seeing all the facts, what role race played in that, but I think it's fair to say, number one, any of us would be pretty angry; number two, that the Cambridge Police acted stupidly in arresting somebody when there was already proof that they were in their own home; and number three, what I think we know separate and apart from this incident is that there is a long history in this country of African Americans and Latinos being stopped by law enforcement disproportionately. That's just a fact. . . .
President Obama and his supporters have helped contribute to this racial tensions in other ways. Every policy disagreement with Obama seems to be interpreted as motivated by racial animus. And the polls show clearly that racial relations have deteriorated both nationwide and in Florida where the Zimmerman trial occurred since Obama first took office. A Viewpoint Florida poll of 900 people asked: Question #5: “In your opinion, have race relations in the United States gotten better or worse since Barack Obama took office almost 5 years ago, or have they stayed about the same?” 53 percent answered that race relations have deteriorated since Obama’s inauguration, with only 10 percent saying they’ve improved. In a poll conducted by the Pew Research Center titled “King’s Dream Remains an Elusive Goal,” only 26 percent of African Americans said the situation for black people has improved in the past five years, and 21 percent said things have gotten worse. In a 2009 poll, 39 percent saw improvements, Pew said. Today, half said the picture is essentially unchanged. Whites had a much more positive opinion of black progress, with 35 percent saying things have gotten better in the past five years. Even among whites, however, that share has fallen from 49 percent in 2009. In the fifth year of the Obama presidency, Pew researchers and scholars of race relations attribute the pessimistic outlook among African Americans to the fading glow of Obama’s first term and the lingering struggle to emerge from the recession. Pew said sentiment is approximately where it was before the recession and Obama’s election. . . .
Why is it that the Post would never consider Obama's racial rhetoric in discussing worsening racial relations? CNN: "A chart in the Washington Post, using data from The Organization for Economic Cooperation and Development, shows Australia to have among the lowest gun-related killings in the developed world. The United States had the highest. Former Prime Minister John Howard told CNN's Christiane Amanpour in March that gun control laws instituted after a mass shooting were responsible for the low number." Christian Science Monitor: "Also getting prominent airplay were comments by former Australian Deputy Prime Minister Tim Fischer that Australian tourists should boycott the US to send a message about gun control. “I am deeply angry about this because of the callous attitude of the three teenagers [but] it’s a sign of the proliferation of guns on the ground in the USA. There is a gun for almost every American,” Mr. Fischer said. The comments reflect the view of most Australians that lax gun laws in the United States are behind the country’s high murder rate and string of shocking massacres such as last year’s mass shooting at Sandy Hook school in Connecticut." UPDATE: Another case in Memphis might have also been a Trayvon Martin revenge killing. “The first and foremost question in De Diago’s mind: If this was a robbery, why did his brother-in-law still have his wallet, car keys, and cell phone? Nothing was taken from him. And witnesses confirm that,” the Blaze reported. The family source told the Blaze that he tracked one of the alleged shooters, Mario Patterson, through his Facebook account, which no longer exists. “He said the page had numerous photos of Trayvon Martin, and he wondered if it’s possible the shooting was a revenge killing for the Zimmerman verdict,” the report said. . . .
Nowadays the federal government leavens its usual quotient of incompetence with large dollops of illegality. This is eliciting robust judicial rebukes, as when, last week, the U.S. Court of Appeals for the District of Columbia instructed the Nuclear Regulatory Commission (NRC) to stop “flouting the law.” Judge Brett M. Kavanaugh said: “It is no overstatement to say that our constitutional system of separation of powers would be significantly altered if we were to allow executive and independent agencies to disregard federal law in the manner asserted in this case.” . . . This episode is a snapshot of contemporary Washington — small, devious people putting their lawlessness in the service of their parochialism and recklessly sacrificing public safety and constitutional propriety. One can only marvel at the measured patience with which the court has tried to teach the obvious to the willfully obtuse. 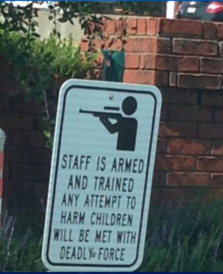 If private schools do this, hopefully it will make it easier for public schools to change their policies. A discussion with the head of an Arkansas Christian Academy is available here. 50 fake IDs to obtain unemployment insurance payments in 8 different states? Using the fake IDs to set up bank accounts for each of the identities? If people are able to commit such fraud even when photo IDs are required, such as for banks, what happens when photo IDs aren't even required? A benefit from higher temperatures? : "China Begins Using Arctic Shipping Route"
The maiden voyage to Europe by a Chinese merchant ship through the "Northeast Passage" will help the world's biggest exporter speed goods to market and is a symbol of Beijing's strategic ambitions in the Arctic. The emerging Arctic Ocean shipping route north of Russia has been opened up by global warming and cuts thousands of kilometres (miles) -- and many days -- off the journey from China to its key European market. A vessel owned by Chinese state shipping giant COSCO left the northeastern port of Dalian last week bound for Rotterdam in the Netherlands, on a 5,400-kilometre (3,380-mile) voyage which state media said would take just over 30 days. That is up to two weeks faster than the traditional route between Asia and Europe through the Suez Canal, according to COSCO. "It's potentially going to change the face of world trade," said Sam Chambers, editor of SinoShip magazine. "The Chinese will use the Arctic route in a very big way. It's all about having options, having alternatives in case of emergency," he said. . . .
Telsa claims that the battery in the Model S will last about ten years. Still let's hope you don't do anything that will cause it not to hold enough of a charge. A new battery pack for the car costs $30,000 (see also this here). Of course, batteries do slowly lose their charge so you might simply find that the car has 90% of the range that it used to have after a couple of years. Telsa does offer an option where you can pre-pay $12,000 when you buy the car to have a battery replaced when you need it. That means the price of the car is really $92,000, not the $80,000 advertised.
. . . a recent online survey show[s] that nearly 84% of respondents believe the young people around them would prefer to play a game of pin die rather than work hard. Meaning something like “powerful daddy,” the phrase refers to competing on the basis of family background. By that, they mean in terms of jobs – more than 80% said they believe many young people have relied on pin die to get ahead at work. The survey was conducted by the Social Survey Center of the China Youth Daily, a state-run newspaper, and web portal Sohu.com. The report said that among the 3,809 respondents, only about 10% of them said they value hard work in becoming successful. When they were asked what occurred to them first when they ran into problems, about 36% said they regretted that they lacked a “good daddy.” While 35% said they chose to solve problems by themselves, 25% said they would ask their daddy to tackle the problem for them. Online reaction to the survey results was divided. “It’s a sure thing, as a daddy provides an opportunity for you,” said one Sina Weibo user. “This is horrible,” said another. “An overturning of the value system.” . . .
Is this even possible? It surely seems hard to believe. My impression was that the national polls had tightened up and Rudd's seat is supposed to be a very safe seat for labor. A discussion of the Guardian poll is available here. An earlier poll from a couple weeks ago showed Rudd in the lead by about 10 percent. UPDATE: Apparently bettors aren't taking the poll too seriously (see here). Thanks to Peter Hartley and Damien S for this info. The conversation on global warming has been stalled because a shrinking group of denialists fly into a rage when it’s mentioned. It’s like a family with an alcoholic father who flies into a rage every time a subject is mentioned and so everybody avoids the elephant in the room to keep the peace. But the political climate is changing. . . .
. . . About 106,000 people in the Garden State are insured under what are known as "basic and essential," or B&E, health care plans, according to state data. Since 2003, all health insurers that operate in New Jersey’s individual health market have been required to sell these plans which, as their name implies, offer only a thin layer of coverage for things such as doctor’s office visits and procedures that don’t involve a hospital stay. In addition to requiring most everyone to carry health insurance, the Affordable Care Act — better known as Obamacare — starting next year will force health care plans to cover certain essential services while capping the out-of-pocket fees people pay in addition to their premiums. . . . Many people who buy B&E coverage tend to be self-employed or work for a small, family-owned business, said Mike Munoz, senior vice president of sales and marketing at AmeriHealth. . . .
About 25,000 of those enrolled were under the age of 24, suggesting that some parents use the plans to cover their children. Another 19,000 enrollees were women between the age of 50 and 64. And just about 10,700 were men and women between the ages of 25 and 30 subscribed to a B&E plan. . . . This breaks both Obama's promise to lower premiums by $2,500 for a family of four and "If you're one of the more than 250 million Americans who already have health insurance, you will keep your health insurance." 2) Meanwhile, even a large company such as UPS is being effected. According to Kaiser, UPS (NYSE: UPS) told white-collar workers two months ago that 15,000 working spouses eligible for coverage by their own employers would be excluded from the UPS plan in 2014. UPS expects the move, which applies to non-union U.S. workers only, to save about $60 million a year, company spokesman Andy McGowan said. The health law requires large employers to cover employees and dependent children, but not spouses or domestic partners, Kaiser adds. . . .
3) Delta Air Lines says that its health care costs will increase by "nearly $100 million" next year. A recently-leaked letter from Delta Air Lines to the Obama administration states that the “cost of providing health care to our employees will increase by nearly $100,000,000 next year,” much of it due to Obamacare. . . .
Ann Althouse: On "Using the Christopher Lane murder to argue for gun control"
If you are unfamiliar with Ann's blog, she often has very insightful posts. Here she discusses the use of almost any incident to push more more gun control. WSJ: 75% of US internet traffic intercepted by NSA, both Foreign and Domestic, and obtains "content of the communications themselves"
. . . The system has the capacity to reach roughly 75% of all U.S. Internet traffic in the hunt for foreign intelligence, including a wide array of communications by foreigners and Americans. In some cases, it retains the written content of emails sent between citizens within the U.S. and also filters domestic phone calls made with Internet technology, these people say. . . .
Much, but not all, of the data is discarded, meaning some communications between Americans are stored in the NSA's databases, officials say. Some lawmakers and civil libertarians say that, given the volumes of data NSA is examining, privacy protections are insufficient. . . . Some polls show a double-digit drop in Obama’s approval rating since Edward Snowden revealed NSA secrets, weakening the president ahead of fall fights with congressional Republicans over the budget and immigration. Polling taken by the Economist and YouGov finds a 14-point swing in Obama’s approval and disapproval rating among voters aged 18-29 in surveys taken immediately before the NSA revelations and last week. Overall, the swing in Obama’s approval rating moves just four points. . . .
Did Maine newspaper completely make up claims about what the Maine Governor said? Approached by local media Tuesday, LePage denied the comments. “No I never said that and you guys are all about gossip, goodbye,” LePage said, according to WLBZ 2. . . .
Littlefield said he is “not going to feed the beast of this paper owned by Donald Sussman,” referring to the owner of the Portland Press Herald, a Democratic donor and the husband of Democratic Rep. Chellie Pingree, which critics see as a conflict of interest. Two other lawmakers, state Reps. Alex Willette and Larry Dunphy, who also attended the event told the Press Herald that if LePage made the comment about Obama, they didn’t hear it. . . .
. . . No one was injured in the shooting and all students and teachers were accounted for and safe. The suspect, later identified as Michael Brandon Hill, fired at least a half-dozen shots with an assault rifle from inside the school and officers returned fire, DeKalb County Police Chief Cedric L. Alexander said at a news conference. . . .
School clerk Antoinette Tuff in an interview on ABC's "World News with Diane Sawyer" said she worked to convince the gunman to put down his weapons and ammunition. "He told me he was sorry for what he was doing. He was willing to die," Tuff told ABC. She told him her life story, about how her marriage fell apart after 33 years and the "roller coaster" of opening her own business. . . . If police and others are allowed access to individual health care information, will that information leak out to others? So many things get hacked these days, it would seem like it is only a matter of time until this private information is released. Mutualink, Inc. will be at APCO 2013 to demonstrate how Google's futuristic specs might be used for everything from allowing an EMT to review health records to helping firefighters access building blueprints. . . .
"Homeowner shoots escaped prisoner in southwest Iowa"
BEDFORD, Iowa An escaped inmate suspected of shooting a southwest Iowa sheriff's deputy was killed Tuesday morning by a rural Bedford homeowner who said the armed man broke into his house, authorities said. Rodney Long was shot to death after he broke into a retired farm couple's home about 10:15 p.m. Monday, awakening them. Long, who was armed with a handgun, cut their telephone lines and used their cell phone, Iowa Division of Criminal Investigation Special Agent Mitch Mortvedt said. After about four hours, Jerome Mauderly, 71, shot Long with a shotgun in the kitchen of the home he shares with his wife, Carolyn, 66. "As the situation wore on the decision was made by the Mauderlys they were going to defend themselves," Mortvedt said. "At 2:11 a.m. the Taylor County Sheriff's Office received a 911 call from Carolyn Mauderly." She told a dispatcher that her husband had shot an intruder. An Iowa State Patrol officer was nearby and quickly responded, finding Long face down on the kitchen floor, Mortvedt said. No one else was injured. Iowa officers, with help from Missouri officers and a Nebraska State Patrol aircraft, had been searching for Long since Sunday night, scouring about 16 square miles, after a southern Iowa sheriff's deputy was shot, Mortvedt said. They had searched the Mauderlys' property three times. The home is about 5 miles west of Bedford. . . . Thanks to Yih-Chau Chang for alerting me to this article. A conservative gadfly who has made a crusade of uncovering embarrassing emails at the Environmental Protection Agency wants to tap a new potential evidence trove: the National Security Agency’s electronic snooping program. Attorney Chris Horner has filed a Freedom of Information Act request, asking the NSA to turn over any information it might have gleaned from former EPA Administrator Lisa Jackson’s personal Verizon email account. The data could buttress critics’ accusations that Jackson and other top environmental regulators have routinely used private channels to discuss public business. . . .
Horner’s transparency crusade has already created some uncomfortable moments for the EPA, most notably by revealing the existence of a secondary EPA email account in which Jackson used the name “Richard Windsor.” Top Republican lawmakers have seized on Horner’s results to back up their own accusations that EPA leaders systematically bypass FOIA’s requirements by using unpublicized or private email accounts to discuss policy with political friends and environmentalists. . . .
NYC Mayor Michael Bloomberg and NYC Police Commissioner Ray Kelly don't seem to understand basic gun safety (discussion available here). Can the mayor understand the difference between criminals shooting others and concealed handgun permit holders? Will a sign in front of the shop stop one gang member from shooting another gang member there? Businesses will be able to opt into the program by visiting www.washingtonceasefire.org, signing the pledge to participate, and placing a “Gun Free Zone” decal in their window. Dozens of businesses, including Neumos, Oddfellows, Elliott Bay Books, Cupcake Royale and Café Racer have reportedly signed up to participate. "I think we've all been disappointed that, in the wake of Sandy Hook, nothing got done in Olympia, But what we're trying to do here today is address the culture of gun violence," said Washington CeaseFire Board President Ralph Fascitelli. Washington CeaseFire says in King County alone, more people die every year from gun violence than from motor vehicle collisions, and between 2007 and 2011, the estimated annual cost of firearms deaths and hospitalizations in King County was $177 million. . . . .
Biden allies believe he could run on some of the accomplishments Mr. Obama notched over two terms. If the economic recovery continues, Mr. Biden could run on the basis that he was a partner in combating the recession. Unemployment hit 10% in the first year of Mr. Obama's term and as of July was down to 7.4%. "My guess is it would be a legacy campaign, continuing to build on the success they've had in the administration,'' Mr. Rasky said. . . .
points were made on the show (starting around 3:30 into the interview). 1) Why do we trust any agency, including the NSA, to investigate itself? violation there could be thousands of Americans who could be violated. administration did more than Nixon even mused about. Contrast this discussion with a recent editorial in the Washington Post. The Fox News' Political Insiders are having none of this whitewashing. rule of law in the US. "Arizona school district asks parents to sign gun pledge"
An Arizona school district is asking parents to sign a pledge promising to lock up their guns and teach their children about the "dangers and consequences" of the misuse of firearms. The Arizona Daily Independent reports that parents enrolling their teens in high school and junior high schools in the Flowing Wells Unified School District in Tucson are being asked to sign the pledge as part of the district's registration process. Under the terms of the contract, parents must agree to "keep any guns and all weapons under lock and away from school grounds and away from my children," the newspaper reported. At least two parents have expressed concerns over the contract, which district superintendent David Baker said was written several years ago and slipped through the review process. . . . Defensive gun use: "Deputies: Riverview man shot dead while beating girlfriend"
A story regarding a case from Riverview, Florida in the Tampa Tribune (August 17, 2013). Given that the attacker apparently had enough time to go out to the parking lot before dying, without Vickie Rock being armed, clearly the police would have arrived on the scene here after significant damage had been done. A 56-year-old Riverview man was shot dead this morning after attacking his girlfriend outside her apartment, the Hillsborough County Sheriff’s Office said. At around 6 a.m., a Vickie Rock, 50, of Riverview, was visiting a home at the Grand Oaks Apartments at 10103 Sherwood Lane in Riverview, when she heard glass breaking and screaming coming from next door, deputies said. Rock, who was armed with a .45 caliber handgun, went outside to investigate and found a Daniel S. Robertson beating his girlfriend, Cristy Vasilakos, 40, with a metal object, deputies said. Rock yelled at Robertson to stop, but when he turned and began attacking Rock, she fired the gun at least once, deputies said. Deputies later arrived to discover Robertson dead in the parking lot.Vasilakos’ front window and front door were heavily damaged, apparently by the Robertson forcing his way into her apartment, deputies said. Both women sustained facial injuries. Detectives interviewed independent witnesses who, they said, verified statements made by the two women. . . . . Thanks Michael I. Krauss for alerting me. Why if you believe what Democrats say, they should support allowing anonymous donations. With Democrats frequently scooping up over $156 million of Obama's donations can in donations of less than $200 in 2004 and more than half of his donations in 2012 that they don't collect information on (apparently many from foreign countries (see also here)), they apparently have no problems with anonymous donations as long as you break it down into many small payments. But the claims from Democrats in a recent The Hill newspaper article provides an explanation why publishing the names of donors discourages races against incumbents. Bevin’s biggest obstacle will be to raise money for his campaign, as many business groups and political action committees will steer clear of the race for fear of offending McConnell, one of the nation’s most powerful Republicans. Democrats have subtly tried to influence other Republican primaries, such as last year’s contest in Missouri. But strategists predict Democratic donors and groups will stay away from Bevin. “It would be an absolute disaster for McConnell to lose in a primary instead of a general [election]. It would send the signal that McConnell is not conservative enough when the signal we need to send is that Kentucky voters don’t like obstruction,” said Adam Green, co-founder of Progressive Change Campaign Committee, which launched a new television ad in Kentucky this week hitting McConnell on Social Security. . . .
"15 Of The Craziest Disguised Guns Ever Made"
100 years ago in England just about everything that could be made into a gun was done so. It is hard to believe that there were so incredibly few gun murders in the country at the time. In 1900, in London, when there were no gun laws and guns took all sorts of disguises, there were two gun murders and five armed robberies. 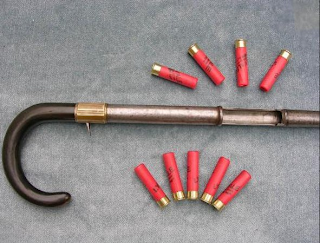 In any case, here is a link to some pictures of guns that have been disguised as different things. We start at the gun drawer. As well as the rifles and replicas, it’s full of walking sticks, umbrellas, flick knives and other random bits of metal. The Curator asks me to guess which are guns, pauses for a heartbeat, before stabbing with his finger: shotgun, shotgun, pistol, shotgun, pistol. The walking stick and umbrella are guns. Even the flick knife is a gun. All have been used on London streets. He demonstrates how quickly and easily they convert, where the barrels and triggers are, and shuts the drawer. The Curator is enjoying himself now, less begrudging by the minute. He picks up a sword and hands it to me. As I reach for it, he pulls off the hilt, which is a short, detachable blade, and makes to gut me with it. The Curator explains: a man attacked some people in a pub with the sword, pretended to hand it over when the police arrived, only to whip out the stabbing blade as the officer exposed his body. . . .
Republican Gov. Chris Christie on Friday vetoed a ban on .50-caliber rifles that was vigorously opposed by firearms rights advocates and gutted a proposal overhauling the state’s gun permit law. Christie said the permit changes adopted by lawmakers were impractical because they rely on technology that hasn’t been developed. “None of the technology necessary for this system exists. … the smartcard called for by this bill cannot be implemented now or any time in the foreseeable future,” Christie said in his conditional veto message. The centerpiece of the bill, sponsored by Democratic Senate President Steve Sweeney, linked firearms purchases and law enforcement records into a digital smartcard maintained by the state police, Motor Vehicle Commission, mental health facilities and ammunition retailers. . . . The proposed ban on military-style .50-caliber rifles went beyond his task force-recommended ban on sales of Barrett .50-caliber long-range rifles and, he said, would have unduly restricted lawful recreational pastime activities. “Tellingly, the Legislature points to no instance of this class of firearms being used by even a single criminal in New Jersey,” Christie said. . . .
More on Christie's decisions regarding other gun laws is available here. Do the proponents of these bulletproof whiteboards know how hard it will be to hold this board when it gets hit by a bullet? Do the proponents realize how small these boards are? Do you think that you will be able to hide behind a 18 by 20 inches board? 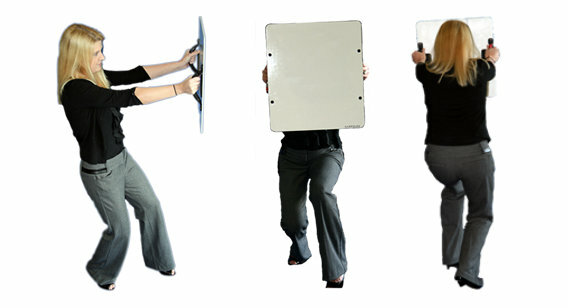 It helps that they have the board being held by a woman who is probably pretty physically small. Calling "campus violence a reality" to prepare for, the University of Maryland Eastern Shore announced plans Thursday to spend $60,000 on the Clark Kent of teacher supplies: an innocuous-looking white board that can stop bullets. The high-tech tablet — which hangs on a hook, measures 18 by 20 inches and comes in pink, blue and green — can be used as a personal shield for professors under attack, according to the company that makes it, and a portable writing pad in quieter times. . . . . There are so many problems with this policy. For example, if you are holding one of these boards when it gets hit by a bullet, it is extremely likely that the board will be dropped or at least significantly moved. If you are holding this board, your hands will also be significantly bruised. People wearing bullet resistant vests will usually get knocked down when a bullet hits their vest when you are dealing with a larger caliber bullet (something larger than a .22). The size of the board also produces fairly limited benefits. If the board were larger, the torque from the board getting hit by a bullet would make it even more impossible to hold. Even the New York Times attacks the Obama administration for hiding information on what it is doing. The public has a right to know the government’s policies on these matters. There is very good reason to be concerned about the government’s interpretation of its police powers, especially given the Obama administration’s insensitivity to privacy in its mass collection of phone data in the national security sphere. When the A.C.L.U. filed a request for the memos under the Freedom of Information Act, the Justice Department responded by handing over copies with the text nearly entirely blanked out, prompting the lawsuit. . . . It is distressing that the administration, which claims to welcome a debate over the government’s surveillance practices, time and again refuses to be transparent about those practices. Instead of awaiting a court order, the administration should release the tracking memos on its own. March 1, 2011: Attorney General Holder again lied to Congress when he said: "decisions made in the New Black Panther Party case were made by career attorneys in the department." Associate A.G. Thomas Perrelli, an Obama political appointee, overruled a unanimous recommendation for prosecution by DOJ attorneys. Feb. 3, 2010: Judge Martin Feldman held the Obama administration in contempt for re-imposing an offshore drilling moratorium that was struck down by the courts. Click on the "obamalawless" tag below to get a more complete list.